Prince Harry falls off horse at polo Jump to media player Prince Harry lost his seating from a polo pony as he played in a fundraising match in South Africa. Harry: 'Afghanistan changed my life' Jump to media player Prince Harry meets Michelle Obama during a visit to the US to promote Invictus Games, and recalls the effect of serving in Afghanistan. 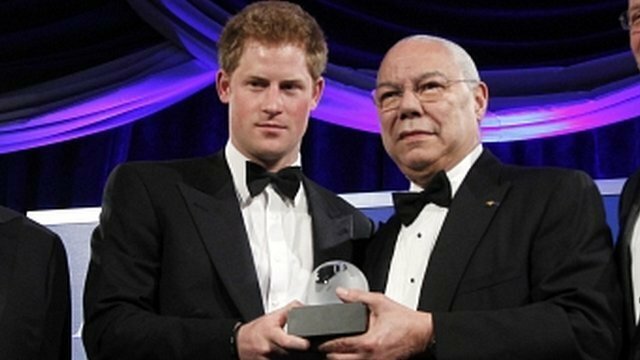 Humanitarian award for Prince Harry Jump to media player Prince Harry has received the Atlantic Council's 2012 award for distinguished humanitarian leadership, for his charitable work with wounded armed service members. 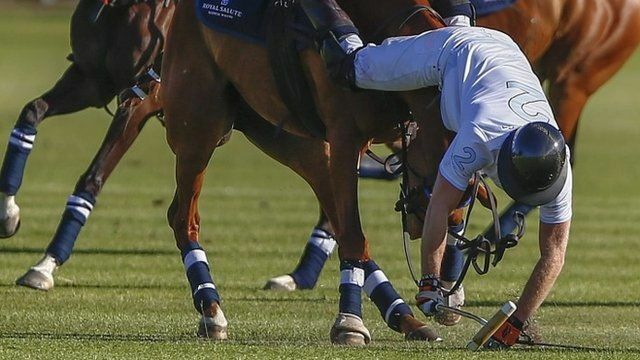 Prince Harry lost his seating from a polo pony as he played in a fundraising match in South Africa. The prince was apparently unhurt and played the rest of the match, which was in aid of his charity Sentebale.